(NewsUSA) - Holiday entertaining can be stressful. What to cook? Which wines pair well? But with a few tools and a bit of planning, you can breeze through the holiday season like an entertaining pro. Janice Mondavi knows this all too well. As a mother of four girls and a member of the iconic C. Mondavi wine family, Janice hosts her large, extended family throughout the holidays. She gets through the season by keeping some go-to recipes on hand and a few quick tips for the perfect wine pairing. Janice's go-to's include her favorite roast recipes and easy, no-nonsense wine pairings. She finds that roasts and steak recipes feed her large family without breaking the bank. Her favorite holiday recipe is the family's "Steak Sliced Thin" New York Strip Steak recipe that was created by Rosa Mondavi, the wife of Cesare and the family matriarch who started the Mondavi wine legacy in the Napa Valley in 1943. When pairing wines, Janice says it's all about pairing similar flavors together. For instance, Janice pairs sweet wines with spicy foods, simple fare with lighter wines, and bold flavors together. She also points out that rules are made to be broken, even with wine. "Wine is simply a matter of personal preference and sometimes it's fun to mix things up, especially during the holidays," she adds. Some people prefer to pair opposite flavors together, and will pair a dry, acidic wine with a rich creamy sauce. Janice loves a good cheat sheet for pairing wines and that's why she and her team at CK Mondavi and Family wines came up with this handy wine-pairing sheet, "The CK Mondavi and Family Wine Pairing Made Simple," which can be downloaded here: www.ckmondavi.com/ckm-pairings. This Christmas, Janice will be making the Steak Sliced Thin Recipe for her family. "It is one of my husband Marc's favorite dishes, is easy to make and everyone enjoys it," she says. Janice will pair this recipe with CK Mondavi and Family Cabernet Sauvignon or Scarlet Five (their red blend). Pound both sides of the steak slices until they are somewhat thin. Season each slice with oregano, salt and pepper (or your steak seasoning of choice). Set aside. Slice the cloves of garlic. Heat 2 tbsp. of the olive oil in a frying pan on very low heat. Add the garlic and sauté for a minute or so. Be sure not to burn the garlic slices. Add the wine and cook until the wine has evaporated. Turn up the heat to medium and begin to sauté the steak slices for about 2 minutes on each side for medium rare, a bit longer if you like your meat well done. Place on a serving platter and pour the excess sauce on top. Serve hot with any of your favorite side dishes. Meet the Mondavis: Click here to view video. 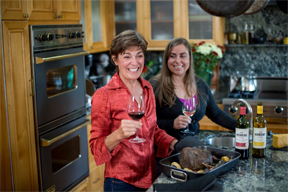 Janice Mondavi and her daughter Angelina Mondavi enjoy making roasts together with their family to celebrate the holiday season.